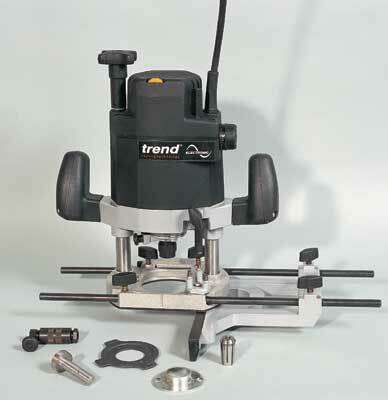 The T9 is what is technically known as a 'big' router; that is, a 1/2in collet machine with sufficient power to run the largest cutters available. This brings it into competition with such behemoths as the DeWalt DW625 (the router formerly known as Elu MOF 177), the Freud FT200, the Bosch GOF-1700ACE and so on. So what do you get? Plenty of power from the 1800W motor, electronically controllable from 8,000 to 22,000 rpm and kicking in with soft-start. All of the accessories you would expect are supplied - 1/2in and 1/4in collets come as standard, the straightforward side fence is fitted with a clever fine-adjuster which acts on the fence bar rather than the fence itself. Spindle lock, dust extraction hood, they're all here - and if you want a metal case you can buy the T9EK. All this is normal in the market, so what is different about the T9? Well - a very big hole. 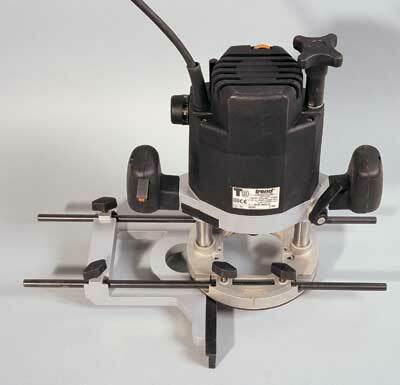 The baseplate aperture will allow a 75mm diameter cutter to pass through - and as cutters get bigger, this is a real advantage. Only one of my 60-odd cutters exceeds this size - it is a fairly dangerous 86mm - so this removes the need for fiddling around fitting cutters with the router fully plunged, as is sometimes required when using a table. Additionally, the large aperture allows for much larger guide bushes to be fitted. The built-in fine depth adjuster works well, and reinforces my impression that the T9 is especially suitable for using inverted, in a router table. I gave it a try in my table with a pretty massive cutter and it performed nicely, the fine adjuster making life easy. Certainly power is more than adequate and the machine runs smoothly. A strong rubber band is required to hold the switch in the on position, as it doesn't lock, so an NVR switch must be fitted to the table. Hand held, impressions are still favourable, but for one detail; the plunge lock lever is both uncomfortable and awkward to operate. In contrast, the rack and pinion-adjustable depth stop is a delight to use and, although the router is tall, it isn't as heavy as some, and is relatively quiet, so I found it comfortable to spend time with. 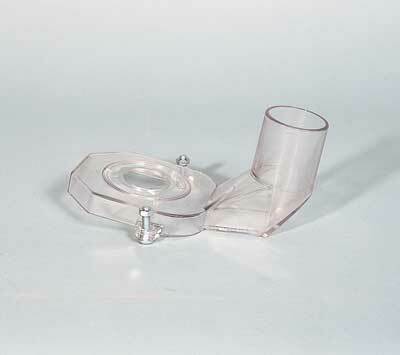 "The baseplate aperture will allow a 75mm diameter cutter to pass through"